This blouse is undoubtedly the most worn item in my closet (see exhibits 1, 2, 3, 4 & 5) but I never get tired of it. Seeing as it's Friday, I decided to amp up the fun factor and pair regular leopard print with snow leopard print. 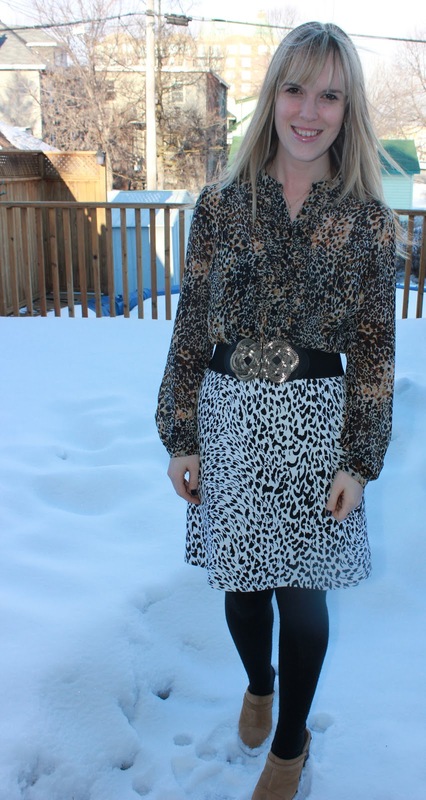 I never would have dreamed of sporting a leopard on leopard combo before I started blogging but why not? Too much animal print is never a bad thing in my leopard loving opinion! I can't wait until the snow clears so I can start showing some toe cleavage and stop carrying my indoor shoes around. Would you pair leopard with leopard? Sure! Mae West said, "Too much of a good thing is just enough!" emily, your leopard on leopard completely works! it's been getting so warm here. we had to turn the air conditioner on the other day. You look great! The double leopard print works because they're different shades/patterns. It's like wearing denim on denim: one light and one dark. You look so pretty, and I love your bangs. I think your stye is great, so leopard on leopard would be great as well! I have a friend who would love your outfit too - she loves everything leopard, even her sheets are like that! I loved your belt!!!!!!!!!! Would have loved to have one like that! You have such balls to pair leopard with leopard, Emily! But you totally ROCK it! And I love the little bits of gold in your accessorizing! After seeing this post, I'm sure thinking about it!